What it is, is a child who does not differentiate between a girl's toy or a boy's toy. (Like most kids). I love this picture, it keeps cropping up in my twitter timeline and it's truly awesome. Here you have a little girl who has lovingly created the sort of multicoloured Lego model that Princess C likes to make. She's probably around the same age, dresses in much the same way as The Princess does when she's having a scruffy stay-at-home day, and she's as happy as heck. So she should be. 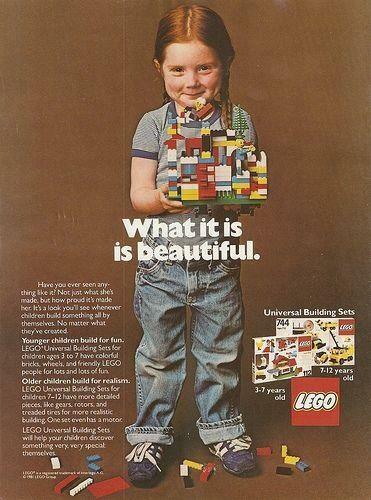 It seems a bit of a shame that this image is being used as a crux pin and point of argument to try and convince Lego to stop producing gender-specific ranges in their current lineup. "Lego Friends" seems to be the range that causes the major bone of contention. It's girl-friendly Lego with a whole host of girl characters who live in a slightly pink-hued world where their cars don't feature laser guns, caltrops or chainsaws but are funky little roadsters for zipping around town. The characters career aspirations are a constant source of scrutiny. One girl wants to be a rock star. Another is like a little mini-Lego Zatana and wants to be a magician while still others are scientists or karate champs. What's quite interesting in the different ways children play with lego is that some (like me) are clearly builders, more interested in the process of making something out of a seemingly random collection of pieces that - eventually - ends up being something cool to play with. Some also like lego purely for the end result, either having something tangible to play (and role play, as Princess C does) with, much in the manner kids play with the brilliant Playmobil toys they have access to these days (again another hotbed of gender-divisional political incorrectness, apparently). Lego are a multi-million pound toy business who know their various markets very well. It's not accidental that Lego Friends is one of the company's most successful ranges ever, selling like hot cakes to girls - and even to boys who rather like the fact that the Lego Friends buildings look a lot cooler than some of the drab stuff they get in the Lego City range. It's also not accidental that Lego still produce their traditional building sets (yes, they do one in a pink box for 'girls' but they also still do the awesome types of set I had when I was a kid and before Lego started machining all those cheaty bits, and just made bricks). Parental ire is better reserved for toy companies who seem to think dinosaurs are a boy's toy exclusively, or that boys shouldn't be allowed near craft or art stuff. How far do you go to protect your kids online?